The Purdue University Football team is taking the spirit of celebrating student superfans to a new level by offering an exclusive opportunity to be featured on the team’s helmet during the special September 27 “Social Media Game” against Iowa. 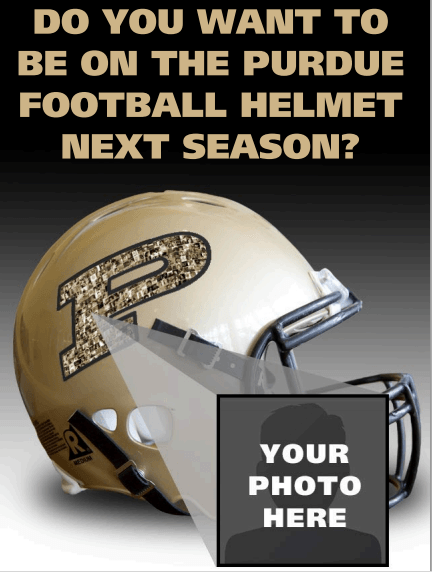 Purdue University students who purchase a VIP Card, a special kind of ticket that allows access to all home football and basketball games, plus other athletic events, through June 10 will be invited to send in a photo to be featured on the team’s official helmet. Existing student season ticket holders will also be invited to submit a photo. Photos on the helmet will then be formed into a mosaic in the shape of Purdue’s “Motion P” logo. Not just any photo can make it onto the special helmets, although this hasn’t stopped a few hecklers from submitting their desired images via social media. The team is requiring student season ticket and VIP Card holders to submit photos of themselves in Purdue gear to a dedicated e-mail address by noon ET Friday, June 13. The university is also plans to e-mail participating students a copy of the final image file to have as a keepsake. While there are a limited number of VIP Cards sold to students annually, the university also confirmed to CBS Sports the possibility to extend this promotion to additional groups in the future. This is not the first time Purdue University has hosted a social media game. In fact, many universities now have dedicated social media games, or increased game specific social media activity. According to the Purdue Sports website, the team hosted a successful series of events around last year’s social media game, including a scavenger hunt, plus contests throughout the game, such as voting for the song the team runs out to during the second half. The team also selected a fan image from the game in real-time from Instagram to be displayed on the video board as the FanGram of the game. What can we learn from these sports teams embracing social media? Being recognized for their loyalty to your company or team will go a long way with superfans. It’s also fantastic if you can sprinkle in opportunities to go the extra mile. Listening to superfans and understanding their passion points will help inspire exclusive opportunities with a wow factor that will keep them raving about your company or team far into the future. The downside of creating a mosaic on the Purdue Football team’s helmet is that each fan’s image will be small. However, the team is smart to email each student an image file, allowing them to further share this experience with their friends and family. Social media posts with visuals garner more engagement than text alone, so the image, plus the “bragging rights” associated with being on a helmet, will generate more awareness for the program. While the idea of a dedicated social media game is clever, why can’t all games harness the power of social media? There could be opportunities to feature VIP Cardholders and season ticket holders on the video board, or invite them on the field before or after the game. The team could also reach out to fans and encourage specific Twitter and Instagram activity around a dedicated hashtag to be featured during the game. There is also an opportunity to host different contests, or opportunities to vote on the in-game music and more on the team’s social media channels that would be available to all game attendees and fans. Have you seen any amazing examples of companies offering their Superfans an exclusive experience? Share it in a comment below!